A romantic, secluded, & private hillside setting with breathtaking views of the canyon, city lights and Palos Verdes Peninsula, will conjure up emotions of a time gone by, a time of tranquility, serenity and refinement. As you meander the two lane road to our private location atop the hills of our quaint bedroom community in La Habra Heights, you will be overcome by the mélange of beauty amid inspiring panoramas, grand facilities, beautifully manicured grounds and world class facilities and amenities. 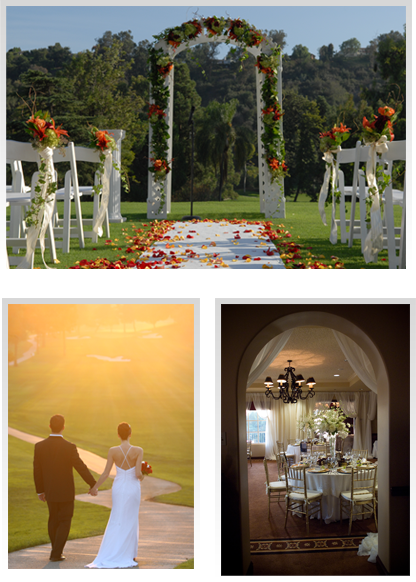 Indoor and outdoor ceremonies and receptions are available and designed to take full advantage of the romantic grounds and unforgettable views of the golf course, canyon and luxurious backdrops. Capturing the true essence and exclusivity we afford our guests, our facility will be exclusively reserved and limited to one wedding per day. An event of this magnitude deserves nothing less. Our award winning culinary team excels in the luxury market. Daily, our team of experts create exquisite cuisine from the world over! Our Executive Chef and Pastry Chef are here to customize a whimsical experience your guests well remember for a lifetime. Our professional management team will coordinate every fine detail of your special day. They will dedicate the day to you and your guests and ensure that our service staff presents first-class service and an unforgettable experience! Their collective experience and performance afford you and your family an opportunity to relax, enjoy and be pampered for this once-in-a-lifetime event.